Priroda was the last of the scheduled five Russian modules of the Mir space station complex and was launched from the Baykonur cosmodrome by a Proton-K rocket to dock after 3 days rather than the usual 9 days. The launch itself was 3 days earlier than the planned date in order to facilitate an American microbiology program. Priroda carried several remote sensing Russian instruments. 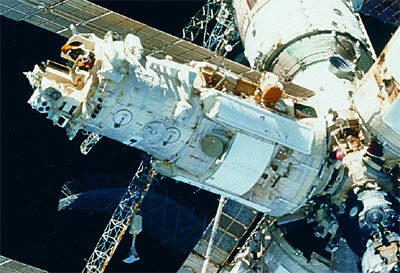 Other cargo on board included 900 kg of American equipment to be delivered to the American astronaut on Mir. It was for a while considered, that Priroda might later be attached to the planned international space station ISS. But evantually Priroda remained with the Mir-Complex until deorbiting. MOMS 02P Earth imager - 4 channels between 0.440-0.810 micrometer. Multi spectral, stereo or high resolution data, 6 km resolution. German instrument, initially flown aboard Spacelab D2 on Shuttle.